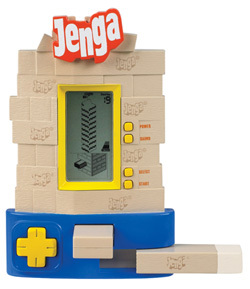 Walmart: Electronic Jenga game only $1! Thanks to Jentry for the heads up on this deal! In Walmarts clearance section the Electronic Jenga games are marked at $1 down from $9! These would make great presents! As always clearance deals can be different at each store, but it is worth it to check it out! Walmart: Tums, Jello and more! Thanks to Deal Finding Chik for these great Walmart deals. 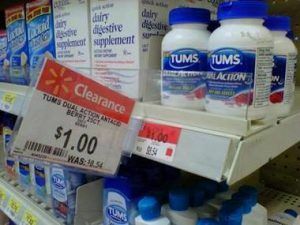 Look to see if your Walmart has Tums on sale. The Tums Dual Action 25ct are on sale for just $1 down from $8.54! If you find this deal, then you can use the $3.00/1 coupon from HERE to get them FREE plus possible $2 overage! Final Price – $.47 cents each! Final Price – $.26 cents each! Walmart Deals: Use those coupons! Between the drama of blogger, my house getting remodeled, and my “real” job. But I am back! Check out the price at Walmart for the K.C. Masterpiece… only $1! Looks like I have 10 free bottles! Walmart has “Rolled Back” the price of their Lysol No Touch Hand Soap Dispensers to $6. There was a $5 off ONE coupon in the 5/2 Smartsource insert, making these only $1 each! Walmart is really rolling out the free samples right now! You can go HERE and request a free sample of Purina One Smartblend Dog or Catfood or both. While you are there check out these free samples also! 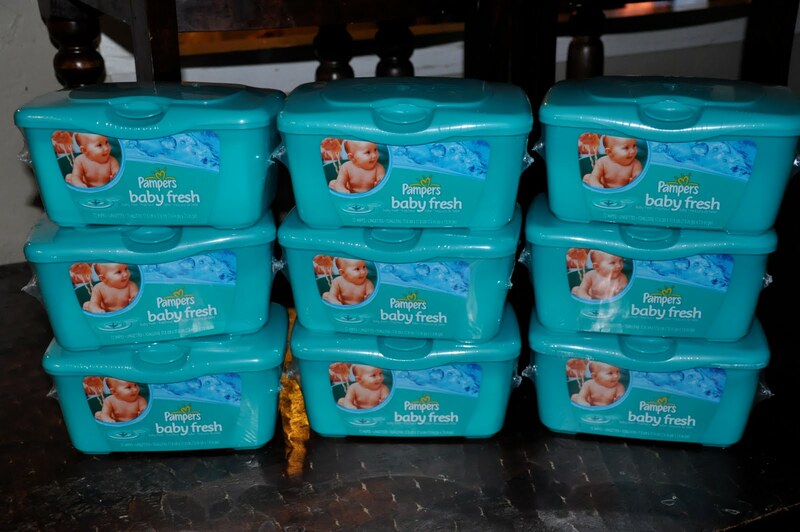 Walmart: Yoplus for $.50, plus 17 free items! 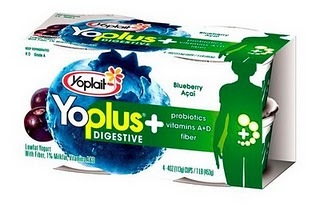 This week on Roll-back at Walmart the 4 packs of Yo-Plus are priced at $1.50. Use the $1/1 printable here to get this for only $0.50 a pack. I freeze these all the time when I get them at a good price and they unthaw nicely. Thanks crystal. For more Walmart deals this week go HERE and see what you can score! Kristen’s list includes 117 items under $1 and 17 free item’s! 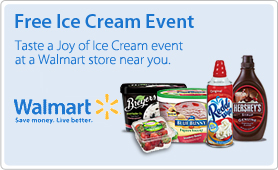 WHAT: Walmart invites families to come have a free ice cream sundae* with Breyers new and exclusive flavors, and Blue Bunny Premium Ice Cream and new All Natural Frozen Yogurt topped with Hershey’s Chocolate Syrup, Reddi-wip, and Fresh Strawberries. The “Free Ice Cream Sundae” event will give moms some sweet inspiration topped with even sweeter savings. As always, I would call ahead to make sure your store is participating. “Sweeten up your weekend with a Berry Festival the whole family can enjoy. This Saturday and Sunday Walmart is offering families the chance to taste the first fruits of summer – strawberries and blackberries. Families can try this season’s berries plain, with Reddi Wip topping or in a pie – to satisfy everyone’s taste buds. Moms can stock up on her families favorite fruits for Memorial Day celebrations or every day enjoyment with Walmart’s rollback prices. Moms can find select packages of blueberries, strawberries, raspberries and blackberries fresh from the farm all under $3. To find a store near you click here. This weekend Walmart will offer consumers free strawberry and raspberry samples on Saturday from 11am -4pm and on Sunday from 1pm – 6pm. Mom can bring home her favorite berries, including blueberries, strawberries, raspberries and blackberries for less than $3, and to add an extra sweet treat for her family mom can pick up fresh blackberry pies for $5.” THanks Courtney! At my Walmart on Sawdust, in the back where they have their clearance, last night they had a pallet full of Nestle Chocolate Chips, all kinds marked down to $1 a bag! Some of my bags of mini chips rang up at $.50! I make the kids cookies every Sunday afternoon, so for my food storage I figure I need about 52 bags of chips for the year, $1 is a GREAT price! I grabbed 30 bags, there must have been aboout 3,000 left! For the past few years I have just stuck with the same two recipes for chocolate chip cookies. Either the Nestle Toll House one on the bag, or the Neiman Marcus recipe if I have to make a LOT of cookies. I thought I would try something new yesterday. I picked this one because I thought the combo of shortening and oil was a little different, since I only use real butter for cookies. They turned out really nice I think. They don’t spread out, they stay chunky and have a shortbread consistency. The kids and Paul gave two thumbs up. 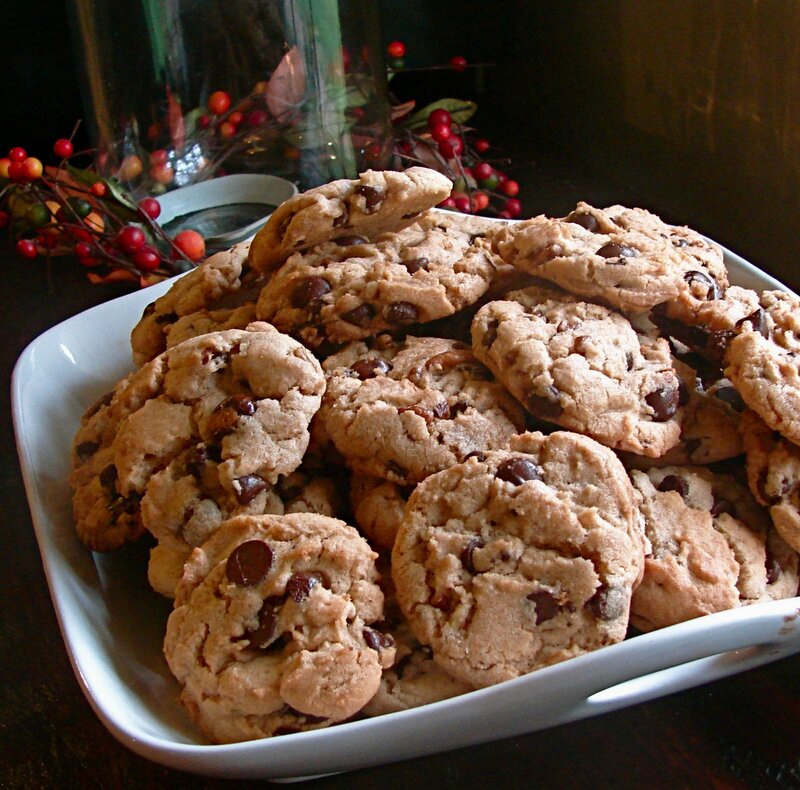 Does anyone have any favorite Chocolate Chip cookies recipes you can post to share that I can try??? Preheat oven to 350 degrees. I an a medium bowl , beat together white sugar, brown sugar, oil and shortening until smooth. Stir in eggs, and vanilla beating well after each addition. Combine the flour, cream of tartar, baking soda, and salt, stir into sugar mixture. Finally, fold in the chocolate chips and nuts. Drop by big spoonfuls onto cookies sheet. Bake for 8 to 10 min. cool on sheet and remove.